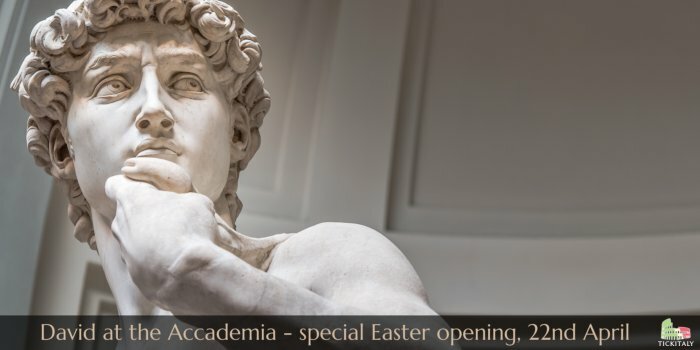 If you’re lucky enough to be visiting Florence this Easter then this announcement may well be of interest – the Galleria dell’Accademia, home to Michelangelo’s David – will be open on Easter Monday, the 22nd of April 2019. The Accademia is usually closed on Mondays, and it may well be that visitor numbers will be lighter … to this end we have arranged a range of pre-booked times for guaranteed skip-the-line viewings of the statue of David – check link below for availability. Skip-the-line tickets for Michelangelo’s statue of David, Florence.